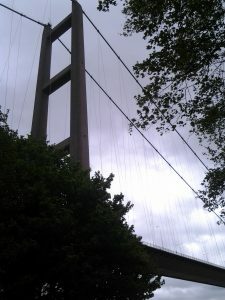 “I’d never crossed the Humber Bridge before which, when it was built in the 70s, was a major engineering achievement, the largest single span suspension bridge in the world. There were all sorts of astonishing facts such as the two towers are so far apart that they point in different directions due to the curvature of the earth, or that if you stacked a hundred double decker busses on twenty football pitches they would be the size of Wales… or something. Crossing the bridge a question struck me. Why isn’t the bridge named something more interesting, romantic like the Golden Gate Bridge? Obviously, we couldn’t call it the Golden Gate Bridge because that name’s already taken, & the Humber Bridge isn’t gold, but then again neither is the Golden Gate Bridge but that’s because it’s named after the Golden Gate Straight which many people outside of the US (including me) might not have known. Couldn’t we have come up with something like the Silver Span Bridge or something that reflects the blue ribbon of the river, except that the river seemed sort of brown the day I crossed, which would mean calling it the Brown Water Span or something. 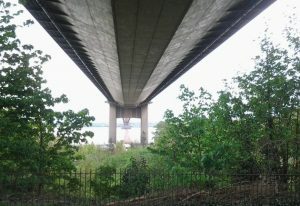 So perhaps we are better off calling it the Humber Bridge after all. Interestingly I’ve since heard a story of a child looking down at the water asking, ‘Mummy, is that chocolate flavoured water?’ apparently reminiscent of the river of chocolate in Charlie & the Chocolate Factory. 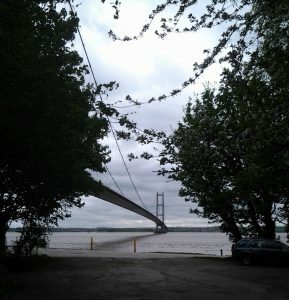 This tells me two things: that the river wasn’t only brown on the day I saw it, & that we could rename the Humber Bridge the Chocolate Crossing. Abridged extract from In SatNav We Trust – A search for meaning through the historic counties of England. A philosophical travelogue through the historic counties of England exploring belief, rationalism, science and religion. A personal journey, autobiographical account, philosophical musings & characters along the way – a unique interpretation of life’s big questions using historic architecture, heritage, history & engineering, to explore & reflect on concepts of science & belief.